Another set of Pokémon Center store distributions have been revealed. To celebrate the Year of the Dragon next year, the Pokémon franchise will not only introduce the Dragon Energy to the TCG, but it will also release Pokémon eggs of Pokémon whose fully evolved forms are of the Dragon type. Available in Japanese Pokémon Center stores will be eggs containing Horsea, Trapinch, Swablu, Bagon, Druddigon, and Deino, all reported to be Shiny upon hatching. These will be made available on four separate occasions from Jan. 6 to Feb. 5; only one egg can be received per occasion. The first occasion will be from Jan. 6 to 15, with the second from Jan. 16 to 22, the third from Jan. 23 to 29, and the fourth from Jan. 30 to Feb. 5. Showing the hatched Pokémon will allow fans to get a set of stickers (image to the right). 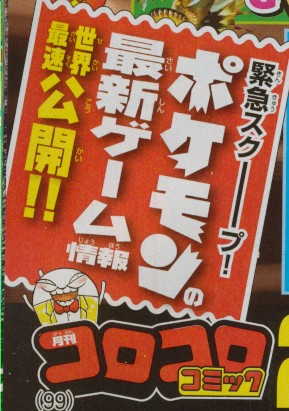 In other news, CoroCoro has announced in its latest issue that it will reveal the next Pokémon game in its next issue, which will come out exactly one month from now, Jan. 14. 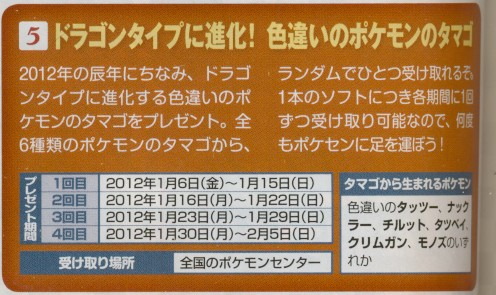 The magazine says that it will be a surprising announcement.